The defining characteristic of an environmental problem is the current or prospective existence of some condition, trend, or deficiency in the environment which adversely affects human welfare. Man-made environmental problems arise because of the side effects of normal socio-economic activity in contrast to such natural phenomena as earthquakes and typhoons. In this respect, environmental pollution is an unintended consequence of the modern way of life. Broadly speaking, the extent of pollution in any country or throughout the world is determined by (1) population size, growth, and distribution (especially trends in urbanization); (2) industrialization and the modernization of agriculture, along with concomittant increases in consumption; and (3) the technology on which contemporary society is based. None of these factors is the sole cause and, in any particular country or during any period of time, one may be a more important contributor to environmental deterioration than the others. For the world as a whole, these three basic variables determine the nature and magnitude of the total ecological burden (i.e. the totality of all demands which human activity puts upon the environment). The management of this burden will require a high degree of international cooperation in the years ahead. The basic objective of international cooperation on environmental problems is threefold (1) to prevent further deterioration of the environment, (2) to reduce, and if possible to eliminate, the pollution that already exists, and (3) to improve the quality of life for both present and future generations. Competing and conflicting national interests on environmental issues can create or exacerbate international tension. In political terms,, the underlying purpose of cooperative efforts to resolve these issues is to reduce or forestall this tension; but international cooperation might also have more specific aims such as strengthening an intergovernmental organization that serves US interests, securing mutual advantages in international trade, or improving the US image abroad. Remedial and preventive action on environmental problems can often be undertaken at the local, subnational, or national level. However, effective control of environmental deterioration sometimes requires the cooperation of several, most, or all countries. International co-operation is frequently desirable even though it may not be necessary. At the very least, nations can profit by sharing their experience with domestic pollution problems and by exchanging information on factors affecting the quality of man’s environment. There is a compelling need for international cooperation in preventing and correcting pollution in any part of the natural environment which is shared by several countries and which therefore functions as a commons. This applies particularly to the atmosphere and the oceans, [Page 7]but also applies to rivers and lakes on international boundaries. The rationale for cooperation on such matters as land use, conservation, and development of inland water resources is critically affected by the sovereign rights of national powers. Apart from territoriality, the basic factor affecting the need for international cooperation in these cases is the economic interdependence of nations. Long-range policy planning to cope with global environmental problems must take account of the total ecological burden. This burden tends to increase with population, growth and with the level of economic activity, whereas the capacity of the environment to provide essential inputs to production and to absorb unwanted outputs from consumption is fundamentally limited. The problem of managing total ecological burden will remain even after world population is stabilized. Controlling that burden by systematic reduction in per capita production of goods and services would be politically unacceptable. A concerted effort is needed to orient technology toward making human demands upon the environment less severe. The issues posed by the continual growth of world-wide demands upon the environment are primarily important for long-range planning, but they also require long lead times for resolution. Cooperative efforts to devise and implement technical solutions to global environmental problems may need to be supplemented by two admittedly difficult measures. One is to move toward zero population growth more rapidly; the other is to re-orient human values, especially in regard to national self-interest versus the interests of all mankind. In general, international organizations deal with environmental matters as they relate to functions established for other purposes. Most of their effort is focused on the exchange of information, cooperative research and data collection, and the production or promotion of studies of the environment. Some cooperative activities consist of action programs for preventing or reducing pollution, and some internationally financed development projects have the net effect of improving environmental quality even though that is not their primary aim. The principal intergovernmental organizations currently concerned with environmental affairs are: (i) the United Nations, including its subsidiary organs, various UN specialized agencies, and the IAEA; (ii) the NATO Committee on Challenges of Modern Society (NATO/CCMS); and (iii) the OECD Environment Committee (OECD/ENV). The principal non-governmental international organizations that have taken steps toward coping with world-wide and regional pollution problems are (i) the International Council of Scientific Unions (ICSU), (ii) the International Union for Conservation of Nature (IUCN); and (iii) the International Social Science Council (ISSC). Two major intergovernmental conferences on the environment are being planned under UN auspices. The UN Economic Commission for Europe (ECE) will convene a Conference on Problems Related to Environment in Prague (May, 1971) which will concentrate on pollution in industrialized [Page 9]nations, especially in urban areas. The UN Conference on the Human Environment will be held in Stockholm (June 1972); it will devote special attention to the adverse effects on the environment that might result from increasing industrialization and unplanned urbanization in the less developed countries. The US will participate in both conferences. The 1971 ECE Conference provides the US with an opportunity to encourage East-West cooperation, but the political significance of any agreement to work together on environmental problems will be greatly influenced by prevailing US and Soviet attitudes toward more critical foreign policy issues. There are no current indications that the Conference itself will become an East-Wept confrontation. It will probably identify environmental programs that could be effectively carried out within the ECE framework and will set the stage for agreements to be negotiated by ECE member states after mid-1971. The 1972 UN Conference presents a challenge and an opportunity to come to grips with the underlying problem of reconciling economic development with minimal environmental pollution. The basic differences in outlook on the part of LDCs and industrialized nations may be a stumbling block in achieving meaningful agreement on environmental issues. A draft declaration of general principles defining the rights and obligations or men, nations, and international organizations in regard to the environment will be debated at the Stockholm Conference; it is likely that any declaratory policy [Page 10]adopted will be fairly ambiguous in order to allow for considerable latitude in interpretation. Proposals to establish a global environmental agency, within the UN system or associated with the UN,, will also be discussed. The acceptability of alternative proposals will depend upon the powers which the new agency would be granted. The UN system provides suitable institutional mechanisms for cooperation on environmental problems which are global in scope, directly affect the interests of a large number of countries regardless of the stage of their economic development, or are likely to become more serious for the LDCs. Existing organizations within the UN system are capable of dealing with a wide range of environmental problems, but their piecemeal efforts need to be counterbalanced by an integrated approach that cuts across established areas of responsibility. NATO/CCMS is intended to operate as an action-oriented catalytic agent of the NATO powers. It has developed a technique for encouraging national involvement in cooperative efforts on environmental problems—viz. using one member country as the “pilot” for a specific project and one or more other member countries as “co-pilots”. This technique might prove to be particularly effective in initiating action programs; if so, it could be used more widely. CCMS can become an exceptionally effective instrument whenever its association with the NATO Alliance does not adversely affect the attitude of nations whose views on environmental matters are important to the US and whose cooperation is essential for solving environmental problems. OECD/ENV combines technical expertise and substantial experiemce in economic policy analysis; it is particularly well suited for dealing with the economic implications of environmental problems, especially issues directly affecting the interests of the principal trading nations of the Western world. The OECD has a tradition of approaching problems broadly, yet keeping its efforts focused on courses-of-action designed to advance the economic development of its member states. Since its membership is wider than that of CCMS and it is not associated with a military alliance, OECD/ENV as certain advantages as an institution for advancing cooperation among major non-Communist nations. Both OECD/ENV and NATO/CCMS provide mechanisms for bringing together policy-makers and technical experts on environmental issues of common concern. In this respect, they do not differ from each other as much as they both differ from UN organizations with world-wide member-ship. Cooperative efforts on regional environmental problems probably can be handled most effectively in regional organizations, either within the UN system (viz. ECE, ECLA, ECAFE, ECA) or outside of it (e.g. OECD, NATO, OAS, etc.). For the time being, OECD and NATO are clearly the most important non-UN Organizations for fostering multinational cooperation on environmental affairs; but in the future other non-UN mechanism such as the OAS might play a significant role. Bilateral or multilateral arrangements outside the framework of existing intergovernmental organizations may be preferable for cooperative research on topics of special interest to a few industrialized states. The interests of both the US and foreign countries are served by cooperative efforts to supplement current knowledge about the environment and about the impact of human activity on environmental quality. Many activities of existing intergovernmental organizations are undertaken primarily for this purpose; they usually consist of encouraging the exchange of information, improving monitoring methods, planning research on a coordinated basis, and collaborating on multidisciplinary studies of environmental problems. These modes of international co-operation are often a necessary preliminary step before effective measures can be developed for dealing with regional or world-wide environmental problems. Additional knowledge may also be needed to help solve national or local pollution problems. In order to bridge the gap between studying environmental deterioration and doing something about it, international agreements are needed on standards and criteria (e.g. air quality standards, permissible levels of DDT residues in foods and feeds, etc. ), as well as on regulatory measures and methods of enforcement. Some specific pollution problems (e.g. controllable oil spillage in ocean waters) could be solved in the near term, provided that feasible techniques for preventing environmental damage are widely accepted and put into practice. In other cases, existing agreements and regulations will probably have to be supplemented to keep the cumulative effects on the environment under control (e.g. carbon dioxide in the atmosphere, toxic chemicals in coastal waters, disposal of radioactive wastes, etc.). International action programs for preventing and correcting environmental deterioration will require funding primarily by the U$ and other industrialized nations. Adjustments in the allocation of resources for US national programs will be affected by the need for concerted action on regional and global environmental problems. There is a continuing need for careful examination of the economic and social costs that would be incurred if action were delayed, undertaken unilaterally, or carried out in cooperation with other nations. Joint efforts to weigh these options would be mutually advantageous. Multinational cooperation on specific environmental problems is needed whenever they cannot be solved by one or a few nations. The relative priority of environmental projects can be very crudely determined by taking account of three factors: (1) the inherent seriousness of the problem from the standpoint of human health or, more generally, human welfare; (2) the scope and emphasis of on-going efforts to solve or ameliorate the problem; and (3) the penalties which nations are likely to pay if they fail to deal with the environmental problem in question. These criteria can be applied to cooperative projects within any area of environmental affairs, as well as to projects concerned with very different types of environmental problems. However, a detailed analysis of particular proposals would be necessary in order to establish a rank order among the many cooperative projects that would serve US interests. Such a case-by-case analysis has not been attempted for the projects listed below. An examination of numerous environmental projects of interest to the US resulted in the identification of 46 priority projects which are either already under consideration in various international organizations (with explicit or implied US support) or could be undertaken by existing intergovernmental organizations. Most of these projects can be grouped under five principal areas of environmental affairs; they are listed below along with a brief statement of the rationale for international cooperation that applies in each group. Atmospheric Pollution. The basic rationale for international cooperation in this area of environmental affairs is twofold: (1) the atmosphere is a commons shared by all nations, and (2) effective measures for preventing and correcting atmospheric pollution usually cannot be instituted by unilateral action. The following nine projects would help to prevent regional and global air pollution problems from becoming critical, though in some cases the project is essentially a preliminary step toward future action programs which would be carried out by national governments. The first six projects (indicated with an asterisk) have, as a group, somewhat higher priority than the remaining three; but no relative priority is implied by the order in which projects are listed. Deterioration of the Marine Environment. While the high seas, like the atmosphere, is a commons, international cooperation to control the. deterioration of the marine environment must take account of prevailing sovereign rights regarding territorial waters and the adjacent seabed. Most ocean pollution problems affect coastal waters; but the obvious inter-connections with the rest of the ocean, as well as the interactions of the oceans and the atmosphere, make any division of the marine environment somewhat arbitrary. The first six projects listed below are specifically concerned with pollution, whereas the other three reflect a continuing need for cooperative research on the indicated topics. Water Pollution and Development of Water Resources. A few of these 46 projects are so closely related to the normal activities of single international organizations that the choice of a most suitable mechanism for multinational cooperation is fairly obvious—for example, WMO for Project A2 and ICAO for Project P8. In most cases, however, the project involves using the special competences of several organizations either because the environmental problem has diverse and interrelated aspects or because the objectives of cooperation require the active participation of different groups of countries (e.g. the NATO community, East-West collaboration, the LDCs, etc.). In general, there is no one-to-one correspondence between priority projects and institutional mechanisms. Even when a single international organization provides the most suitable vehicle for advancing US interests in coping with an environmental problem, there are usually other organizations that would have a legitimate interest in the project and they would almost certainly expect to play a significant role in some phase of its execution. The attached Summary Table (p. xxiii) indicates the relationship between selected priority projects and various intergovernmental organizations involved in environmental affairs—notably, specialized agencies, affiliates, and components of the UN system; the NATO/CCMS; and the OECD Environment Committee. For each project, a distinction [Page 19]is made between the principal organization(s) that would be involved and those which would perform an advisory or supporting role. When two or more organizations are shown in the former category, they are either the most suitable mechanisms for handling different aspects of the project or are equally capable of taking the lead on the project as a whole. In some cases, non-governmental organizations such as ICSU or IUCN might provide support for research studies or independent recommendations for action by national governments. 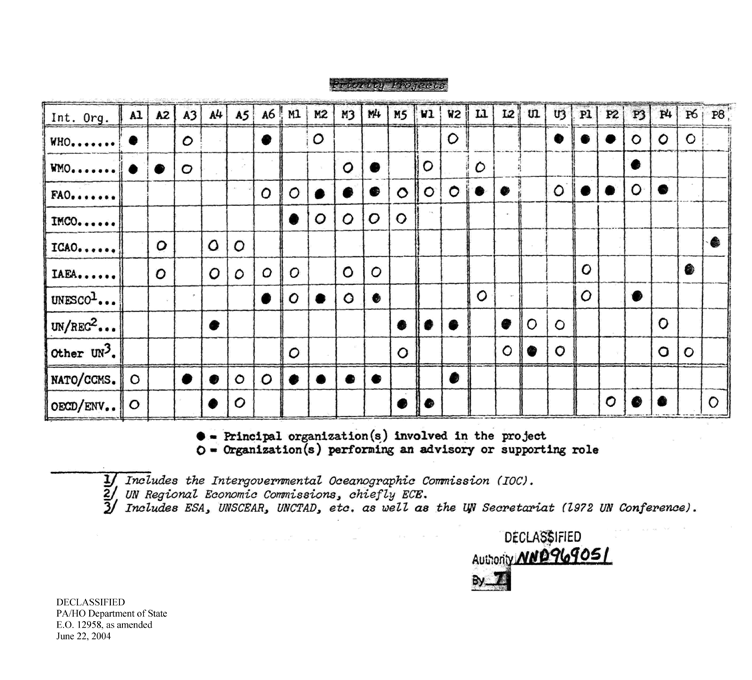 U.1 The 23 projects included in the Summary Table are those which require multinational cooperation in the near term, either because cooperative research and data-collection are essential before action programs can be initiated or because further progress in coping with the environmental problem in question is likely to be difficult to achieve by unilateral efforts. They may be regarded as the projects which deserve special emphasis in formulating US strategy for international cooperation in the area of environmental affairs. U.2 The 23 excluded projects are somewhat less urgent or are concerned with environmental problems which nations can tackle without international agreements that go beyond the exchange of information. Borderline cases are unavoidable since these selection criteria are imprecise. There are also numerous cooperative projects in addition to the 46 mentioned above that would serve US interests and might be proposed for consideration at the UN Conference in 1972. The US has opted for a pluralistic approach in the choice of organizational mechanisms for pursuing its objectives in international cooperation on environmental affairs. It will work through the United Nations and its related organizations, through NATO/CCMS, and through the OECD Environment Committee. Two interrelated problems are likely to arise: (1) duplication of effort, and (2) coordination of activities. V.1 In part, duplication arises because international organizations tend to define their roles in rather broad terms. Some duplication of effort is probably unavoidable, since the environment has many interconnected aspects and multidisciplinary studies cut across traditional boundaries. In many cases, duplication is more apparent than real and a certain amount of over-lapping of functions may even be advantageous. V.2 Outright duplication of effort can be reduced by more effective coordination of the programs and activities of the semi-autonomous agencies within the UN system, as well as between the UN and non-UN organizations. In order to avoid wasting money and scarce manpower, the US needs to improve the coordination of its own activities in dealing with the international aspects of the environment. Better coordination is needed to assure that US delegations are guided by consistent instructions which are binding. Some reduction in the size of US delegations to meetings of international organizations would be desirable. The coordination of environmental activities within the UN system will almost certainly be discussed at the Stockholm Conference in 1972. Attention to this problem is being given in the preparatory work for the conference, but there is a need for improving coordination of the continuing activities of the UN organizations that will be concerned with environmental affairs for many years to come. A strong case can be made for using the UN as the focal point for the formulation of overall policies and for coordination of action programs. For these purposes, a new Council on the Environment might be established as am imtegral part of the UN; the Council’s work in such areas as world-wide data collection, exchange of information, monitoring, and setting standrws could be suitably insulated from political confrontation and nterference. An alternative approach would be to establish a new environmental agency, either within the UN system or separate from it. A new specialized UN agency on environmental affairs might be seriously handicapped by competing with existing specialized agencies that have substantial experience and a legitimate interest in enviroranental matters; it might become bogged down in jurisdictional conflicts. An independent environmental agency would probably have a more limited membership, at least initially, than one within the UN system. The US would probably have a pre-eminent position in the independent organization, but participation by the LDCs might be difficult to secure. In addition, the UN agencies are not likely to surrender their environmental programs to an outside agency or be willing to coordinate their activities under its direction. Effective action on many global environmental problems, including the management of total ecological demand, requires not only international cooperation but also long-range planning. New questions about means and ends will undoubtedly emerge in the course of planning for the satisfaction of future needs and wants within the constraints imposed by a finite environment and the uncertainties inherent in the development of new technologies. It may be necessary to devise new forms of multinational decision-making in order to resolve environmental issues affecting the interests of all mankind.